While it might be a surprise to arrive in Florence and find one of the greatest American 20th century painters in the Renaissance city, finding Pollock at Palazzo Vecchio is itself an even more interesting proposition. There are many types of exhibits, some are celebratory, some highlight recent studies of works of art and some are just fashionable (which doesn’t mean they don’t have substance). 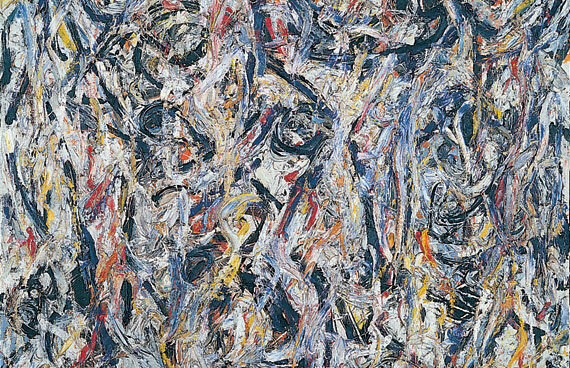 What kind of exhibit is “Pollock: The Figure of Fury“? I was curious to check it out, since Florence in the last few years is slowly creating more spaces to display modern art and work by contemporary artists. It is natural to think of Florence and imagine it, as many call it, an “open air museum” but it is generally of masterpieces from its glorious past, the Renaissance. Consider that as we admire works of art from past masters, from Leonardo da Vinci to Michelangelo to Botticelli, they were at their time, also “contemporary” artists in their own time. 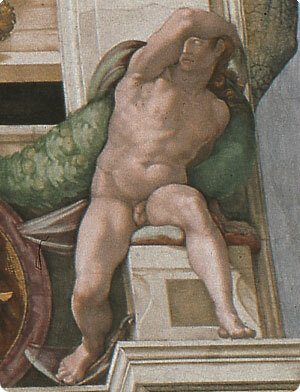 The idea at the base of this exhibit is the connection between the Renaissance and the contemporary, studying just two masters from each period, Michelangelo and Jackson Pollock. What is the connection? 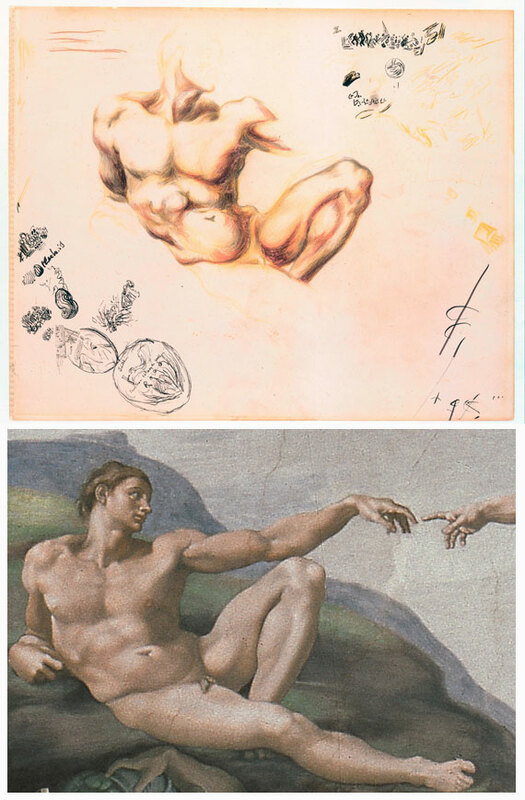 By studying Jackson’s early work and his formation, we actually come to discover he studied Michelangelo. For the first time ever in Italy, from the archives from the Metropolitan Museum of Art in New York, the exhibit includes 6 drawings from Pollock’s sketchbooks where he sketched Michelangelo’s figures. These are an absolute treasure to admire, the ones that are the most surprising and which I enjoyed the most. To see the main lines sketched to form muscles and figures as well as see other “doodles” on the side. 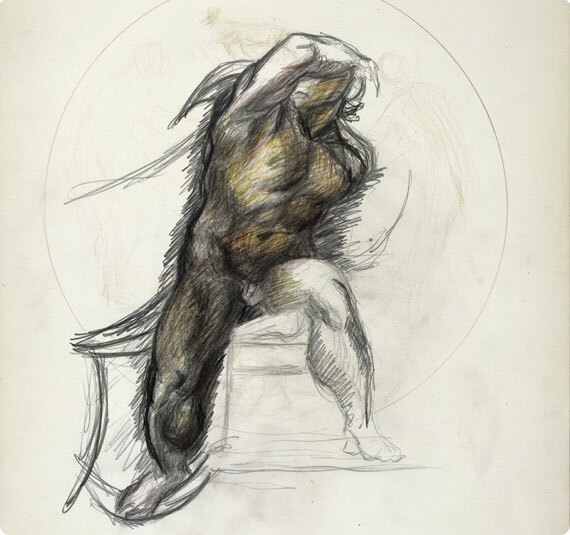 We surely glimpse the “fury” and “energy” within these sketches, maybe more Michelangelo’s than Pollock’s and from here we might start to see the connection the exhibit tries to make. In addition to the sketches from the Met, there are 10 other paintings by Pollock lent by international museums and private collections which include early works from the 1930s as well as incisions and graphic works from the 1940s and 50s. The ones from the 1940’s, untitled from the Washburn Gallery and the Pollock-Krasner Foundation in New York, are the ones that most remind one the tangle of limbs and bodies found in Michelangelo’s “Battle of the Centaurs” (in Casa Buonarroti in Florence). The works are beautiful pieces, but quite small. 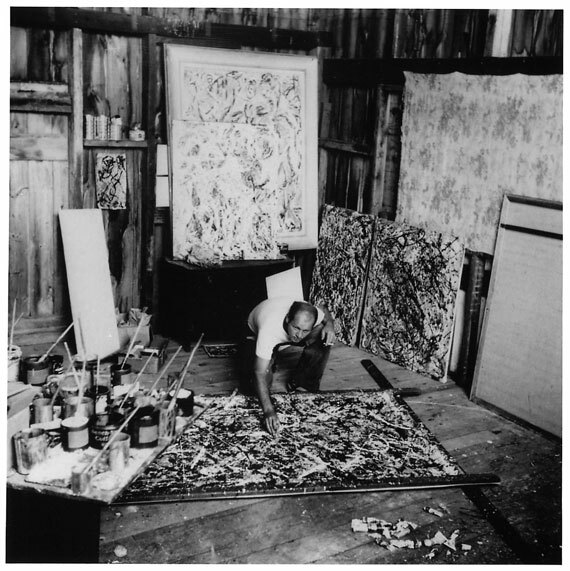 Anyone who admires Pollock knows that his method of painting and work itself was influenced by SIZE and we don’t have that here…. so head on to Piazza San Firenze, where the multimedia exhibit takes you into Pollock’s studio and into the creation of his works. This is the first time I see something like this, it is like stepping into the artist’s studio where you have a chance to better understand the passion and “fury” of creation. The illusion of stepping into the studio and walking inside a painting is both intriguing as well illuminating. This part of the exhibit presents a clearer understanding of Pollock and his work, so if you’re interested in Pollock, make sure to not miss this part!